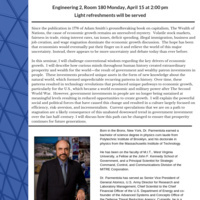 In this seminar, Dr. Parmentola will challenge conventional wisdom regarding the key drivers of economic growth. He will describe how curious minds throughout human history created extraordinary prosperity and wealth for the world—the result of government and wealthy patron investments in people. These investments produced unique assets in the form of new knowledge about the natural world, which formed unpredictable recurring patterns in history. Over time, these patterns resulted in technology revolutions that produced unique pathways to economic growth, particularly for the U.S., which became a world economic and military power after The Second World War. However, government investments in people are no longer being sustained at meaningful levels resulting in reduced opportunities to create growth. Dr. Parmentola will explain the powerful social and political forces that have caused this change and resulted in a culture largely focused on efficiency, risk-aversion, and incrementalism. Current speculations that we are on a path to stagnation are a likely consequence of this unabated downward trend in government investment over the last half-century. I will discuss how this path can be changed to ensure that prosperity continues for future generations. Dr. Parmentola has served as Senior Vice President of General Atomics, U.S. Army Director for Research and Laboratory Management, Chief Scientist to the Chief Financial Officer of the U.S. Department of Energy and co-founder of the Advanced Systems and Concepts Office of the Defense Threat Reduction Agency.